Connecting with Github allows you to promote the highest accessibility for developers looking to access the website's source code, and to take advantage of Github's free hosting](pages.github.com). You'll sign up for a Github account if you don't already have one, create a public repo, and push (or upload) the project files to Github through Git commands. You should be able to access the blog by going to yourusername.github.io/repo-name. Find the (link: whoisryosuke.github.io/gatsby-blog-tutorial text: example site here), and the (link: github.com/whoisryosuke/gatsby-blog-tutorial text: final example repo here). 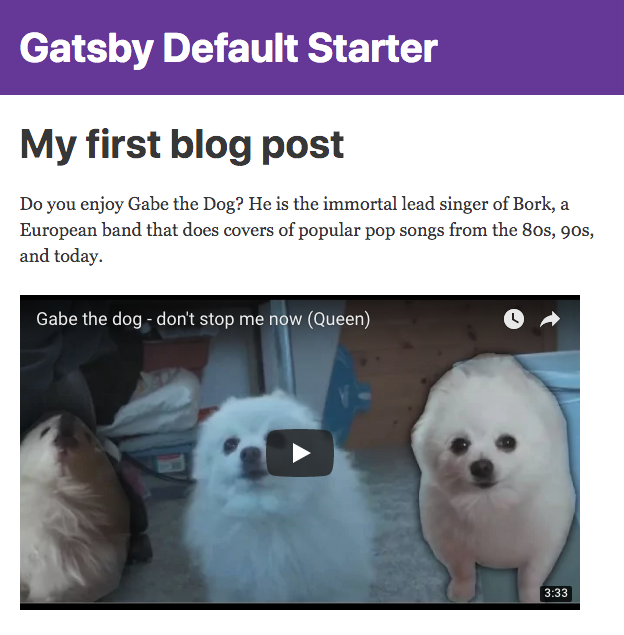 Hello, I would like to know how did you implement pagination on the Gatsby blog? Sorry I am still a newbie. I try to build a full web app using Gatsby. Thanks so much! Thanks for this oscar! I was looking into the npm package also but this example would be a great help. I will be using pagination for a certain web app I am coming up to so studying this would be a great help! :) Thanks again!